Welcome to Semester Two at GCHS! Welcome to Semester Two! Classes begin on Monday, February 5. There are a number of changes to our staff list as of this semester. First, we would like to express our congratulations and gratitude to Mr. Stu MacIver, who has retired from the school to pursue his automotive repair business. Stu will be missed by everyone! Mrs. Maydell is off on maternity leave after she and her husband welcomed their son to the world. Congratulations, Mrs. Maydell! We would like to welcome Mr. G. Arsenault (TCJ3C, TCJ2O, TIJ1O); Ms. D. Gerrard (ENG1D); Ms. J. Miller (ENG1P, NBE3C, and CHC2L); and Mr. B. Skean (ENG2P, AVI3O, and ENG3E/ENG4E). While GCHS looks for a new automotive teacher, Mr. L. Barrett will be covering the classes. 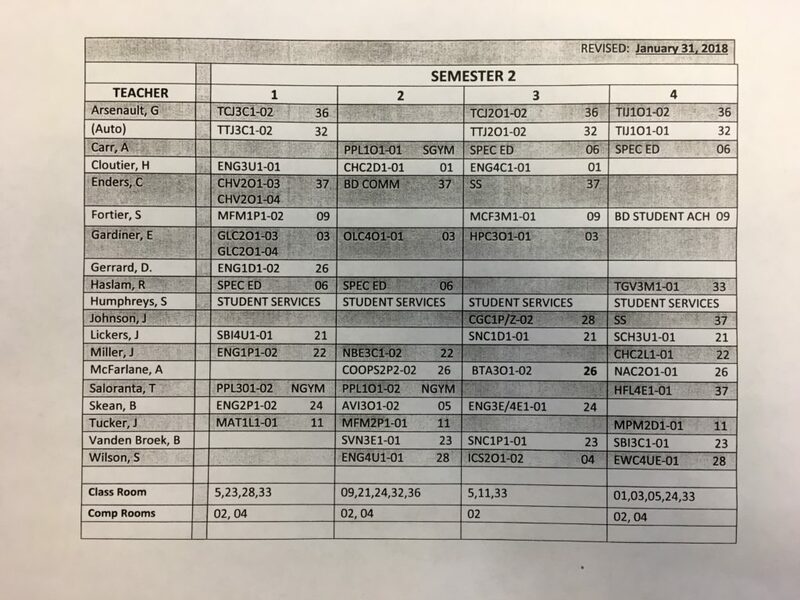 Here is the current GCHS Timetable. Students requiring timetable changes need to book an appointment with Student Services as soon as possible. A sign-up sheet is posted outside of Student Services. Students are also reminded to return textbooks from semester one courses to Fran in the library. Attendance is a key factor to success. Come every day! Thanks, and see you on Monday! I wish all the best to my long time friend Stu MacIver. I am looking forward to another fishing trip.